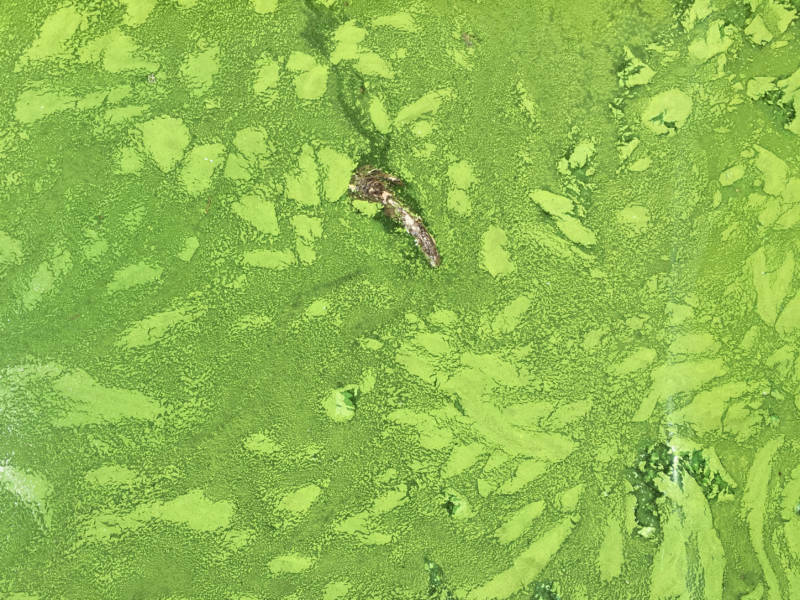 Algae blooms are a natural feature of summer, but the record levels of cyanobacteria, or blue-green algae, are rattling state officials this year. She says her inbox overflows with reports of new algae sightings every morning. In some parts of the state, it looks like someone poured a giant can of green paint into the water. And the smell can be rank. When a bloom dies, it reeks of rotten eggs. So far this summer, the state has posted warning signs at 30 freshwater lakes and reservoirs — advising boaters and swimmers to stay out of the water. It's not just the number of outbreaks that's worrying. It's also the toxins blue-green algae can produce. 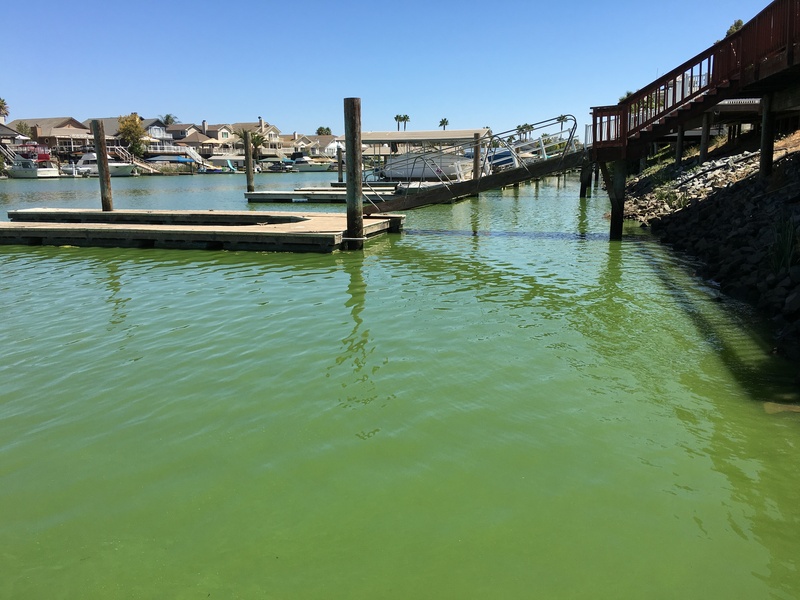 Health officials get nervous when they detect microcystin, one of several toxins produced by algae, at 20 micrograms per liter. This year, they're detecting levels of 150,000 micrograms per liter. But don’t worry — there have not been any reports of contaminated drinking water. Utility districts are screening for toxins to try and keep tap water safe. Plus, drinking water is usually drawn from levels far below where algal blooms tend to float in reservoirs. Boaters and swimmers are the ones who are suffering. Discovery Bay, a suburb east of Walnut Creek, is normally buzzing with boats and jet skis. But this year the waterfront has been eerily still for weeks. There isn’t a soul in the water. Local resident Dave Holmes says he’s never seen anything like it. “We’ve been here since 2002. It is by far the worst we’ve ever seen," he says. With disgust, Holmes watches his white speedboat and blue kayak bob in mucky green water behind his home. Kathy and Alfred Gulizia cringe from their table at the Boardwalk Grill. Slime wraps around docks at Discovery Bay's marina. “We’ll swim in our pool at the clubhouse where we live,” says Alfred Gulizia. Wade Hensley regrets jumping in the water in mid-July. He ended up in the hospital because his body went numb from the waist down. His doctors can’t explain why he still can't feel his legs and feet a month later. County health officials did find microcystin in Discovery Bay. Common symptoms are dizziness, rashes, fever and vomiting -- not numbness. But it can be lethal to dogs and livestock, since the animals are more likely to drink the water or lick the slime off their fur. Twenty two states have had toxic algae outbreaks this summer. Florida declared a state of emergency in two counties, and a bloom sickened more than 100 swimmers in Utah in July. In 2014, 38 states and the District of Columbia reported harmful algal blooms in lakes or other freshwater bodies. Scientists blame a changing climate for the blooms — at least in part. Shallow waters allow the sun to penetrate easily, and bacteria thrives in hot water. "We have created these massive bathtubs for them to be able to bloom in," says Anderson. "Tubs are nice and warm, and that’s what these organisms need." Add fertilizer runoff from farms, golf courses and lawns to the cocktail — nitrogen and phosphorus are the main culprits. This year is especially bad, because Northern California’s wet winter washed an unusually high concentration of these and other nutrients into the water. But toxic algae is not only showing up as a result of urban pollution. Scientists are starting to find blue-green algae in surprising places like pristine mountain lakes and alpine streams. Worst of all, scientists are just starting to understand a problem they expect to escalate. Less oxygen can lead to massive fish die-offs, leaving an ecosystem completely altered. In 2010, a microcystin outbreak killed sea otters off the coast of Monterey Bay. Scientists are scrambling for solutions. Algaecides can help temporarily, but the chemicals can also backfire by promoting other toxins. There’s nothing to do now but wait for the green muck to disappear, and hope for a cold winter to kill it off.